My book about Ifá is finally out – and yes I say, finally. 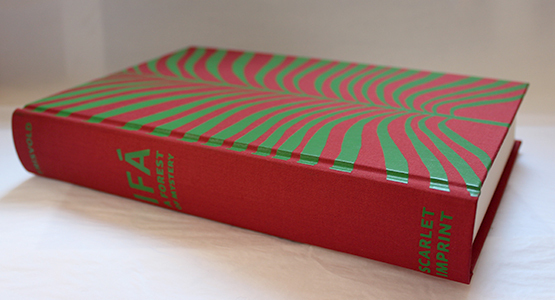 This book took around two years to compose and nearly the same amount of time with the wonderful Peter and Alkistis at Scarlet Imprint to manifest in the form of ink, paper and talismanic design. It could not have been in any other way. Ifá deems patience as a virtue that lies at the root of blessings and in this nearly 1500 day project patience have been the virtue of writer and publisher alike. And speaking of patience, I met the Araba Olayinka Babatunde Ogunsina Adewuyi for the first time in 2003 and shortly after I started study traditional Ifá with this sage and it was only a good decade later I felt I had some sort of idea of the complexities of Ifá sufficient to write a book about this traditional African philosophy. Prior to this I went to Cuba and made Ifá there as well, but it was traditional Ifá that captivated me, because here I found philosophy and here I found tradition expressed in a timeless manner befitting every living soul in profound and mysterious ways with the overarching aim of making sense of life and attract good fortune in all its variety. In the upcoming interview with Gordon at Runesoup, Gordon pointed out that the marvel with Ifa is not that it is a modus of divination, but a tradition that have a divination system – and the profundity in that observation lies at the root of Ifá as a practical philosophy that includes the invisible realm and the visible realm related to vibration, effect and solution born from knowledge and wisdom. The word Ifá have no straightforward translation but it means ‘to pull’ or ‘to attract’ and if the development of good character is the axis that ensures attraction we will reap blessings or lessons that enables the cunning that turns lessons into blessings. To develop good character is key here, because it means that character is something that is forged through the journey of life with its pull to do good and its pull to curse, like carbon turns into diamonds under pressure. The insistence on imperfection and the joy of this imperfection spreads out in Ifá through thousands of poetic meters and proverbs that speaks of situations replicating themselves in difference and repetition, always aiming towards solutions. These situations and solutions are not bound to Africa or more specifically the Yoruba speaking people, but speak of the human condition at large and touches any and every living being they be on the visible or visible side of the veil that separates the worlds. I can go on and on with this, but a book counting 400 pages can’t hardly make a blog posting justice to the richness of Ifá, so I will only state that with this book my attempt was to compose an introduction to Ifá that would also benefit practitioners in demonstrating the rhythm and essence found at the core of Ifá philosophy as revealed in its verses that unveil a profound metaphysics as well as a practical wisdom. On a more personal note this work presents my concept of what ‘tradition’ is through its practical philosophy and I believe this book is ‘something good’, a book that will aid towards making sense of life and also answer the big questions concerning meaning and reason. We are divine beings on a human journey, we are bound to fail and succeed, if character is the goal and if character is what attracts all possible fortune, well you might find something of worth and resonance in the page of this book.